This would make the connection between a field and its label machine-readable, enabling easier handling for accessibility purposes. Also, this mark-up would be slightly lighter to download that the current <div /> solution. Thanks to Nico for the suggestion. 05 February 2008. 1 minute read. 03 August 2005. 1 minute read. 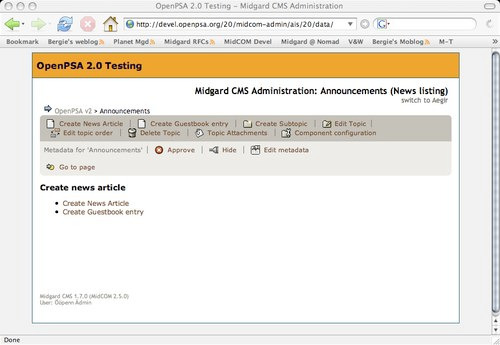 AIS, the Authoring Interface System in Midgard CMS is now getting a new look. The tables and old HTML are now gone, replaced by much more streamlined XHTML and CSS.